I'm a Goddess, and I Poop Too! Purchase this amazing shirt here. I am not an affiliate and will receive no compensation for any purchase you make. Have you seen these shirts? What a joy. 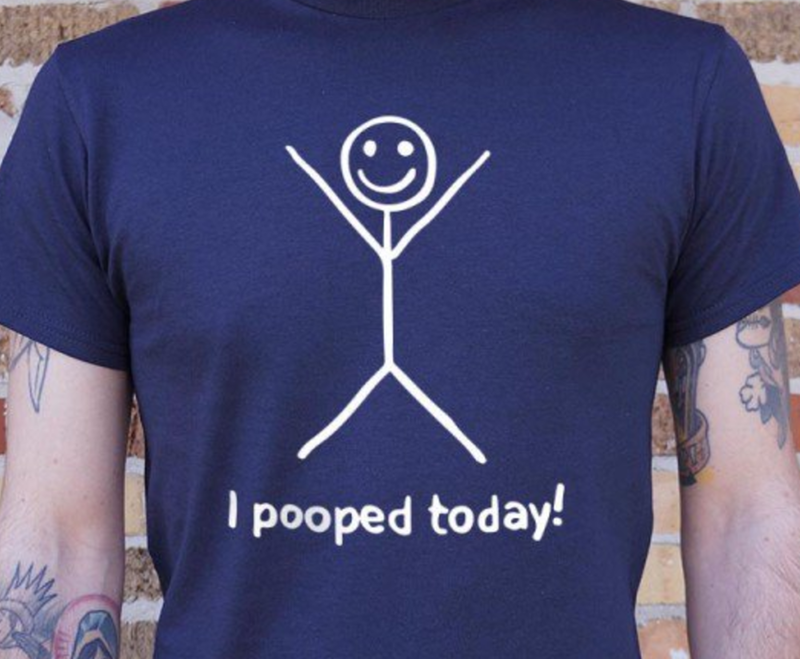 "I pooped today!" What a celebration of the mundane. I love talking about poop. It's a regular household conversation in the Rader home. Pooping is an important and vital part of life, and it's important to note whether it happens - or doesn't - and if there's any changes to texture, smell, color, etc. Just ask Sarah Kucera at Sage; a woman after my own heart. In my first Ayurvedic discussion, she asked me about poop. If I was unsure about Ayurveda before, that sold me. Also, I'm goofy. And not easily embarrassed. I was the kid who had a lot of energy - and this was before I started drinking coffee at age 14. My extra energy comes off in the form of goofiness. I make funny faces, dance to no music (in public), and, oh, it also means I have a wild curiosity for just about anything. I want to know how the planets move. I am interested in wildcrafting. I'd love to learn to crochet. My Bachelor's degree is in Visual Arts and for a while I thought I would be a professional glass blower. I'm currently in training to become a Priestess. Even though I am now teaching yoga and it's basically my dream life, I still ponder on going back to school to become a marriage and family therapist. Not because I want to be a therapist - but because I am fascinated by it. Life is so interesting. When you have as much energy as I do, and need as much mental stimulation, and have such natural curiosity - well it very easily turns into goofiness. I am the girl in yoga class who is just getting started after a seventy-five minute heated flow. I am the girl who shimmies her entire body while everyone else finds stillness. I am the girl who sighs way too loud and "goes rogue" on the teacher's directions. For a long time I thought I had to choose: goofiness or goddess. Goddess or goofiness. I love sparkly things. I love getting dressed up and feeling super sensual. I love the photos of women in dresses in the water. I admire women who are so in their feminine element and I love that part of me, too. But also - I drink water out of old peanut butter jars. I wear $12 yoga pants from TJ Maxx. My pajamas are a combination of my husband's sweatpants and old flannel shirts. I take yoga very seriously. It has offered me the most potent transformation and I love the idea that I might be able to share a nugget of wisdom with someone else that might drastically change their life, just like it changed mine. But also, I recognize that - it's just yoga. One day we will still die. Like Elizabeth Gilbert says in Big Magic - art (and yoga, because to me it's one and the same) is both the most important thing you will do in your life, and also it's completely, absolutely frivolous. And isn't that just wonderful? It frees you from the tyrrany of your inner critic. Because, ultimately, it is not necessary, but gosh it makes life so much better. So, here I stand before you. I am a Goddess. I am powerful, I am of divine power, I am strong and educated and humble and feminine and mysterious and absolutely radiant.